(i) Candidates having training from any reputed organization will be preferred. (ii) Having experience and knowledge about frisking. Applications (8 nos. copies of application) in the prescribed form of the University are invited from the intending eligible candidates for the following posts so as to reach the undersigned on or before 25/01/2019 along with a Bank Draft of Rs. 500/- in favour of the Registrar, Dibrugarh University, Dibrugarh, payable at Punjab National Bank, Dibrugarh University Branch (Branch Code-994000). 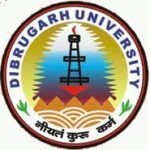 Security Supervisor Vacancy – Last Date 25 January 2019, Dibrugarh University recruits Security Supervisor Posts. Candidates with Graduate experience can apply.